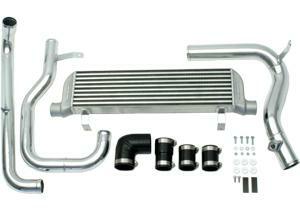 NEUSPEED Intercooler Kit - Dezod Motorsports Inc - Home of the automotive performance enthusiast since 2002. NEUSPEED’s new front mount intercooler kit is truly a bolt-on affair – no cutting or trimming of any metal is required. Your vehicle’s OE intercooler is inefficient and prone to heat soak – especially on chipped high horsepower applications. Over time, during spirited driving, the OE intercooler becomes heat-soaked and robs your engine of precious horsepower. With our front mount kit, your car will deliver consistent horsepower run after run! Engineered for the utmost performance, the kit features lightweight polished aluminum tubing, silicone hose couplings, cast aluminum end-tanks, and an ultra efficient bar and fin core design.